Infant Bayleigh Ann Oquendo passed away Friday, December 22nd, 2017. 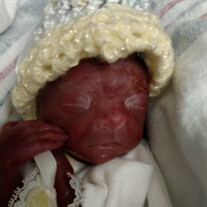 She was preceded in death by her great-great grandfathers, Troy Coles and James Massey. She is survived by her parents, Daniel Oquendo and Ashlyn Heron; grandparents, Byron Heron Jr, Amelia and Nathan Knatcal, Shelia and Juan Oquendo; great-grandparents, Rebecca Broadaway, Johnny Coles, and Denise and Lloyd Knatcal; great-great grandmothers, Lillian Massey and Levada Coles; three aunts, Brittany Oquendo, Emily Oquendo, and Savanah Pousson, four uncles, Braxton Shoulders, Destin Pousson, Anthony Oquendo, and Jonathan Oquendo; and a host of great aunts, great uncles, cousins, and other extended relatives. Graveside services will be Wednesday, December 27th at 2 PM at Lee's Chapel Cemetery of Sandtown with Bro. Freddie Tims officiating.